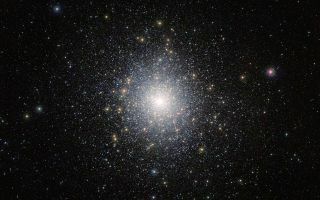 This bright cluster of stars is 47 Tucanae (NGC 104), shown here in an image taken by ESO’s VISTA (Visible and Infrared Survey Telescope for Astronomy) from the Paranal Observatory in Chile. This bright cluster of stars is 47 Tucanae (NGC 104), shown here in this amazing space wallpaper taken by ESO’s VISTA (Visible and Infrared Survey Telescope for Astronomy) from the Paranal Observatory in Chile. This cluster is located around 15 000 light-years away from us and contains millions of stars, some of which are unusual and exotic. This image was taken as part of the VISTA Magellanic Cloud survey, a project that is scanning the region of the Magellanic Clouds, two small galaxies that are very close to our Milky Way.